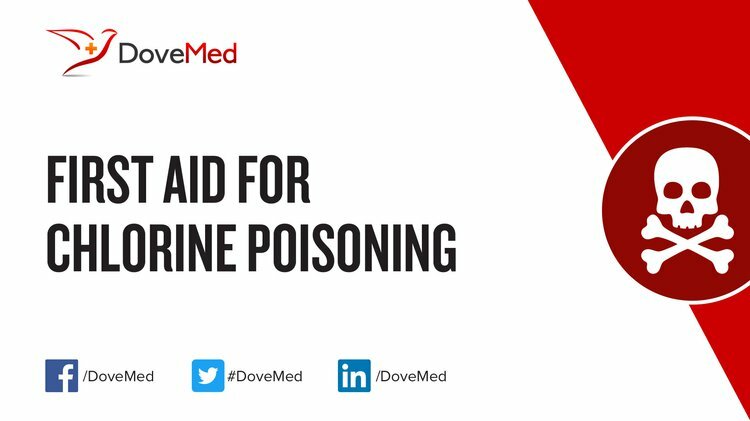 Chlorine Poisoning is the accidental or intentional intake (swallowing, breathing-in, or skin contact) of any product containing the compound. What are the Causes of Chlorine Poisoning? What are the Signs and Symptoms of Chlorine Poisoning? The signs and symptoms of Chlorine Poisoning can vary from one individual to another. It may be mild in some and severe in others. Several systems of the body, such as the vascular system, digestive system, respiratory system, skin, and ENT may be affected. How is First Aid administered for Chlorine Poisoning? Who should administer First Aid for Chlorine Poisoning? First aid for Chlorine Poisoning is administered by healthcare professionals. What is the Prognosis of Chlorine Poisoning? How can Chlorine Poisoning be Prevented? Squadrito, G. L., Postlethwait, E. M., & Matalon, S. (2010). Elucidating mechanisms of chlorine toxicity: reaction kinetics, thermodynamics, and physiological implications. American Journal of Physiology-Lung Cellular and Molecular Physiology, 299(3), L289-L300. Yadav, A. K., Doran, S. F., Samal, A. A., Sharma, R., Vedagiri, K., Postlethwait, E. M., ... & Matalon, S. (2011). Mitigation of chlorine gas lung injury in rats by postexposure administration of sodium nitrite. American Journal of Physiology-Lung Cellular and Molecular Physiology, 300(3), L362-L369. Luo, Y., Nou, X., Millner, P., Zhou, B., Shen, C., Yang, Y., ... & Shelton, D. (2012). A pilot plant scale evaluation of a new process aid for enhancing chlorine efficacy against pathogen survival and cross-contamination during produce wash. International journal of food microbiology, 158(2), 133-139. Jones, R., Wills, B., & Kang, C. (2010). Chlorine gas: an evolving hazardous material threat and unconventional weapon. Western journal of emergency medicine, 11(2), 151. Massa, C. B., Scott, P., Abramova, E., Gardner, C., Laskin, D. L., & Gow, A. J. (2014). Acute chlorine gas exposure produces transient inflammation and a progressive alteration in surfactant composition with accompanying mechanical dysfunction. Toxicology and applied pharmacology, 278(1), 53-64. White, C. W., & Martin, J. G. (2010). Chlorine gas inhalation: human clinical evidence of toxicity and experience in animal models. Proceedings of the American Thoracic Society, 7(4), 257-263. Kokouva, M., Bitsolas, N., Hadjigeorgiou, G. M., Rachiotis, G., Papadoulis, N., & Hadjichristodoulou, C. (2011). Pesticide exposure and lymphohaematopoietic cancers: a case-control study in an agricultural region (Larissa, Thessaly, Greece). BMC public health, 11(1), 5. Duncan, M. A., Drociuk, D., Belflower-Thomas, A., Van Sickle, D., Gibson, J. J., Youngblood, C., & Daley, W. R. (2011). Follow-up assessment of health consequences after a chlorine release from a train derailment—Graniteville, SC, 2005. Journal of Medical Toxicology, 7(1), 85-91. Collombet, J. M. (2011). Nerve agent intoxication: recent neuropathophysiological findings and subsequent impact on medical management prospects. Toxicology and applied pharmacology, 255(3), 229-241.